I realized I've been quiet lately but contrary to recent speculation, we have not drown in all the recent rain. While there has been a ton of rain, the only issues it has caused us is unbalancing the pool chemicals, making the pool too cold to swim in, and making the grass grow really quickly. 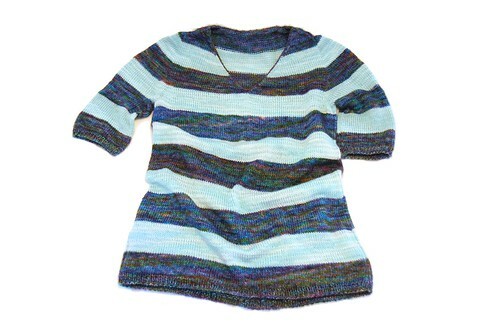 Not much actual news going on here but I did finish a new knitting project: another sweater! It was a nice, educational experience in that I learned a new way of doing contiguous sleeves. Sadly, the new sleeve method is not for me as it makes me broad shoulders look even broader, but not all sweaters can be perfect! I'm working on a pair of socks that I had intended to finish last month but (obviously) didn't. But I've only got a little bit more to go on them so I'm sure I'll be posting about them soon! The only yard news I have is from our front porch (because there has been too much rain to go tromping): we have more baby birds!